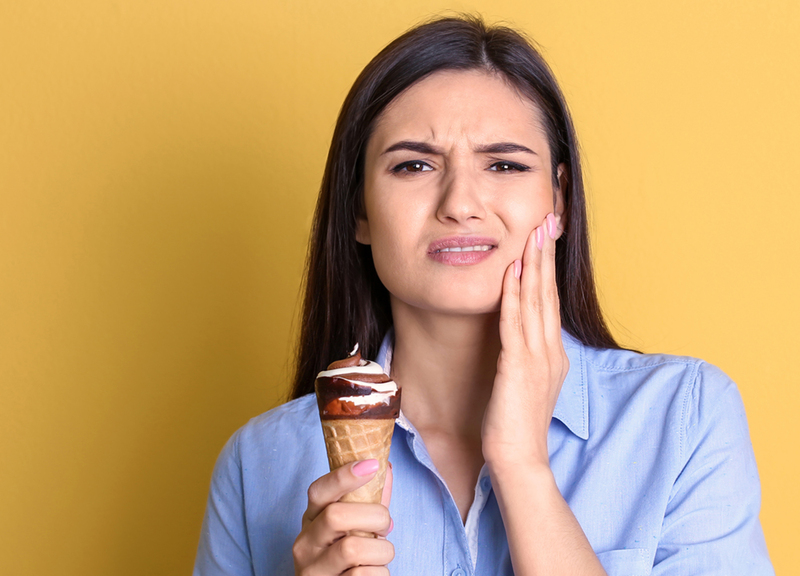 If you cringe from pain every time you eat ice cream or sip hot coffee, you might want to talk to our office about having sensitive teeth. If that’s the diagnosis, don’t worry – we have treatments and steps you can take to find some relief. One of the biggest culprits of tooth sensitivity is worn-down enamel. This hard layer helps protect your teeth, and when it’s gone, the dentin (the middle layer of the tooth) is exposed. Dentin contains hollow tubes leading to your nerves, so when it’s exposed, your nerve endings are left vulnerable. Brushing too hard. If you have a heavy hand when brushing or use a hard-bristled toothbrush, you may be eroding your enamel. Grinding your teeth. Stressed and taking it out on your teeth? This is sure to wear down your enamel. Having excessive plaque. A buildup of plaque can cause tooth enamel to wear away. Eating acidic foods. If your nerves are already exposed, acidic foods like citrus, tomato sauce and pickles can cause pain. Using tooth-whitening toothpaste. The chemicals in these toothpastes can cause sensitivity. Using too much mouthwash. Over-the-counter rinses and mouthwashes can contain alcohol and other chemicals that can make your teeth sensitive. Gum disease. Receding gums and gingivitis can cause tooth sensitivity. Decay around fillings. Fillings can fracture, weaken or leak around the edges – making it easy for bacteria to accumulate and cause enamel breakdown. Fluoride gel. This technique strengthens enamel and reduces the transmission of sensations. A mouthguard for grinding. Your dentist can provide you with a mouthguard that specifically fits your mouth to avoid the damage done by grinding. A crown, inlay or bonding. These may be used to correct a structural problem that causes sensitivity. Surgical gum graft. This will shield the root and minimize sensitivity if your gum tissue has been lost. Root canal. Your dentist might recommend this if your sensitivity is severe and can’t be treated by other means. Keep in mind that some treatments – such as fluoride gel or toothpaste for sensitive teeth – may take time to see results. And your teeth may need time to adjust after in-office treatments; initial sensitivity may wear off on its own. If you’re experiencing tooth sensitivity, we encourage you to visit one of Greenhill’s experienced dentists. We will get to the root of your pain and discuss which treatment options are best for you.